WARNING: The theme of this blog for the next 3 months will be slowly evaporating ignorance masquerading as insight. So, obviously, I have arrived. I’ve spent the last week trying to get my bearings, and I’m still only just getting started. Rather than write a novel about everything that has happened since I arrived, I will list just a few of the experiences of cultural difference that have perplexed me. In Mumbai, I waited an unbelievably long time in a partially air-conditioned corridor to take the shuttle bus* from the international terminal to the domestic terminal. So long (almost an hour) that I began to wonder if we weren’t subjects in some kind of psychological experiment. It takes two men to drive a cab to the airport: one to drive the car, and one to talk on his cell phone while the other guy drives the car. I have a houseboy who brings me food, washes my dishes and my clothes, and cleans the apartment. He speaks about five words of English, which are: breakfast, lunch, dinner, outside, and tomorrow. For some reason, all of my furniture, the refrigerator, and the washing machine disappeared. I asked the houseboy where they went, and he said, “Outside.” I asked him when they would come back, and he said, “Tomorrow.” This was on Wednesday. They have not reappeared. * Note to my Indian readers: in the U.S., we prefer to take the monorail between airport terminals, as the monorail is the Transportation of the Future (cf. Epcot). We reserve buses for the poor, the infirm, and the insane, or use them to get to rental car agencies, hotels, Atlantic City, or Hooters. In any case, they run every 15 minutes. 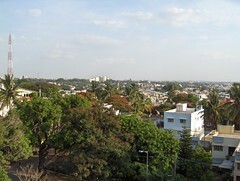 I’ve uploaded my first Bangalore photo set to Flickr.